Home FamilyChildren	Trying to Conceive but Struggling? Trying to Conceive but Struggling? Have you ever tried to conceive? Have you ever had to? In this instance, I don’t mean sitting down with your significant other and deciding together that now is the right time in your lives to have a baby and then getting pregnant. I mean, have you ever had to actually try because finding yourself at the other end of a positive pregnancy test after sharing intimate time with your mate wasn’t something that you could identify with? We have. If you’ve been a reader of our blog for any period of time then you likely know that I am the proud momma of an intelligent, beautiful, sassy 6-year-old little girl. In my home, amongst my family, and in my heart she is our miracle baby. Why? Because I never expected to have her. After becoming aware of a number of medical issues, all female related, at an early age, I never thought that having a child would be something that I would be able to experience. Doctors warned that it would be difficult at best and highly unlikely. I was very open about this with my then boyfriend, now husband, when our relationship became serious and he would always smile, give me a hug or a kiss, and assure me that we would have a good time trying and we left it at that. Years later, we were still unsuccessful and though I desperately wanted to be a mommy, I all but gave up hope and tried to focus on being happy with what I had. And then it happened. After weeks of not feeling well and coming home from work just to go to sleep on the couch and only getting up to eat and go to bed, we decided it was time to take a pregnancy test. My period was late but that wasn’t a surprise, it always was, so I hadn’t really paid attention. Eight tests later, because the first two or so weren’t good enough, we confirmed that we were pregnant, and almost ten months later we were parents. She’ll be seven in November. We had hoped that her birth would awaken something in my body or perhaps trigger some of my hormones to indicate that now was the time for baby making and we weren’t through. Nearly seven years later we have tried to conceive the good ole fashioned way, with the assistance of my gynecologist and medication, and with a specialist that provided medication, shots, and assisted with numerous IUIs. None of our attempts have been successful. If we aren’t meant to have another child then that is something that we will have to come to terms with. Thanks to our little lady we are blessed in ways that I can’t even begin to describe in writing, but she wants to be a big sister, and we are still holding out hope. Some have said we are selfish. Medication, shots, and IUIs are costly and that takes away from our daughter. Some say we were blessed once and should leave well enough alone as it doesn’t appear we were meant to have multiple children. We’ve discussed all of this, we have discussed having another baby until we were both blue in the face. It’s something that we still want. The list of “whys” is lengthy and not one I feel I need to share with everyone. Our reasons are ours and that is that. We have tried for years to conceive but our last real attempts were last year when we worked with physicians for a little over a year and were unsuccessful. Anyone that struggles with fertility understands that taking pregnancy tests monthly and having them come back negative, especially after taking measures to insure they will come back positive, is devastating, heartbreaking, emotionally draining and exhausting. Last November I requested that we take a “break” and my husband graciously agreed. Nearly a year later, we are both in a different place mentally and emotionally … at least I hope. Now that school is back in session and life is starting to settle down, we have decided that we would like to focus on trying to expand our family again. However, this time, we are taking a different approach. An approaching that is being made possible thanks to a new product that we were introduced to, the Stork OTC Home Conception Device. The Stork OTC is a uniquely designed medical device you use at home, during ovulation, to assist your chances of becoming pregnant. Our FDA–cleared, over-the-counter device combines an innovative applicator and an established conception technique – cervical cap insemination. This smart technique enables the sperm to quickly bypass the vaginal tract and places the sperm as close as possible to the opening of the cervix, right where it needs to swim up through to get to the egg. The Stork OTC is designed to be used as a “next step” for you and your partner when trying to conceive, before advancing into more costly in-clinic reproductive treatments. We plan to restart our journey by focusing on successfully conceiving naturally by pinpointing ovulations and optimizing our chances with a home conception aid, the Stork OTC. At this point in our lives we would love to have another baby but we have opted to try to do so without taking steps that would be costly. If our story resonates with you and your experiences or those of a family member or friend, we hope that you will consider learning more about the Stork OTC. This product is available online or in-store at one of our favorites, CVS! 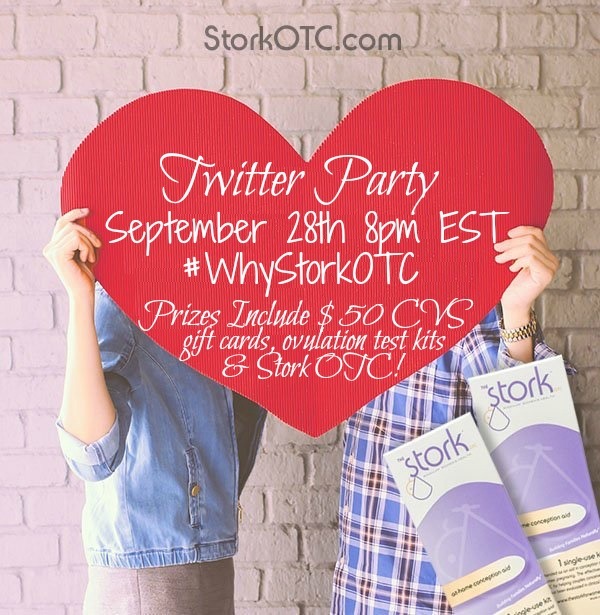 As a bonus, Stork OTC will be hosting a Twitter Party on September 28, 2016 at 8:00 PM EST. Attending the Twitter party will not only give you the opportunity to win prizes, but Stork OTC will be on hand to answer your questions, and provide more information about their product. We’ll be there so you will also get the chance to connect with people in the community that understand infertility, how difficult this journey is, and we can all bounce thoughts and ideas off of each other! We look forward to seeing you at the party! We hope that you will join us on our journey. If you are willing to send positive baby vibes we would greatly appreciate it. Keep an eye on the blog in the coming months as we share our experiences with Stork OTC. Hopefully there will be developing news and in the not too distant future we will be able to add another beautiful picture, like the one below, to our family photo album! Disclosure: I am a Stork OTC Ambassador. All opinions are my own. #whyStorkOTCBabyConceiveConceptionConception AidDoctorsFamilyHaving a BabyHealthHome Conception AidInfertilityParentingRelationshipsStork OTCStork OTC Home Conception AidTrying to Conceive but Struggling? We went through this, it was so difficult. My heart goes out to every person who faces this and wishes everyone joy. Do you use these, Heather? I'd love to know if anyone you know personally has had success with this product.